Have you ever dreamed of being able to walk into the kitchen, look in the fridge and go ‘I’ve got this and this and this. I’m going to put these things together and make something that tastes good’? When I was first learning to cook I followed recipes religiously because I didn’t have the confidence to cook on my own. But I remember wishing I could just ‘throw something together’. These days that’s pretty much how I cook most days. I see what I have and take it from there. So how did I make the leap? It was a few things. Practice and being willing to give it a try certainly helped. But one of the biggest game changers was developing the habit of prepping my ingredients. Because there’s nothing like opening the fridge and seeing loads of possibilities. Being able to grab out a tub of this and a jar of that and know you’re going to be eating something truly tasty and healthy soon! There’s something about having about having the broccoli already chopped and roasted or the lentils already cooked and seasoned that makes it easier to imagine what you can make. It really gives confidence that you can throw a meal together. Not to mention making you feel on top of things as you look into your beautifully organized fridge. Saves time – prepping ingredients in advance makes it so much quicker to get weeknight (and other) meals on the table. Plus cooking in bulk generally doesn’t take much more time. For example making a big pot of quinoa and freezing the extras means you’ll have quinoa ready to go without spending much more time than packing it up. And there’s no extra cleanup either! Keeps thing flexible – unlike making a whole meal in advance, prepping ingredients doesn’t ‘lock you in’. For example some roast sweet potato could become a warming soup for a cold rainy day. BUT if the weather is unseasonably warm it can just as easily turn into a sweet potato salad. Reduce waste – for many ingredients, especially fruit and veg, prepping and partially cooking makes them keep for longer. This is because cooking destroys enzymes and reduces the presence of spoilage microbes. For example, where that bunch of organic kale may start to go yellow and sad looking after a week in the fridge, if you cook it down it will easily keep for two weeks or more. Not only is wasting less fresh produce good for your conscience and your wallet. It’s much better for the planet too! 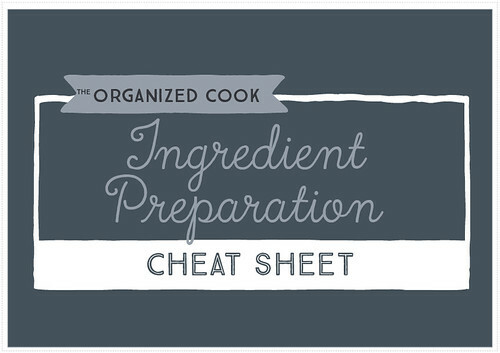 How to master the art of ingredient prep. 1. start small & plan for success. So you’re probably all excited to get going but the worst thing you can do is buy a fridge full of fresh produce, get overwhelmed and forget about them. The real power of the art of ingredient prep is turning it into a habit so it becomes practically effortless. So focus on taking baby steps and focus on really building the habit first. You can always upscale your ingredient prep efforts later, once you have the habit embedded. 2. Choose 1-2 ingredients to prep. I’ve included a ‘cheat sheet’ to download and keep. Use it to get ideas. If you’re not very confident in the kitchen it’s a good idea to decide how you’re going to use them. And make sure you get any other ingredients you need. 3. Buy your ingredients and prep them. See the ‘cheat sheet’ for instructions. Download link below. 4. Use your ingredients one night this week! And congratulate yourself for taking the first step to becoming more organized in the kitchen! Click HERE to download your cheat sheet. You may need to ‘right click’ and ‘save link as’..
‘Things’ on a bed of creamy hummus are some of my favourite quick, healthy mid-week meals. While the Spiced Beef with Hummus from my FREE eCookbook will always be one of my go-to meals, this version using chorizo is a close second. Love the contrast of the hot spicy sausage with the cool creamy hummus, the crunchy hazelnuts and the fresh greenness of the salad. So good! 1. Heat a little oil in a medium frying pan and cook chorizo until well browned on both sides and cooked through. 2. Divide hummus between two plates. Top with cooked chorizo, hazelnuts and salad leaves. no chorizo – use other spicy sauasage, salami or ground meat. Add a little chilli if you want more heat. vegetarian – replace chorizo with roast veg and serve with a drizzle of chilli oil or your favourite hot sauce. low carb / paleo – use the Roast Cauliflower Hummus from my new website, Deliciously Diabetic. nut-free – replace hazelnuts with extra chorizo or crumble over some feta or goats cheese. more substantial / carb lovers – serve with warm tortillas or flat bread. Like some help getting organized? I’ve just created a FREE 5-part email series to show you how to get the benefits from being more organized in the kitchen. ps. The FREE email series includes a FREE downloadable / printable ‘cheat sheet’ which will give you a big head start. Thank you so much for this free e-book! We are going to love every single one of these recipes!! 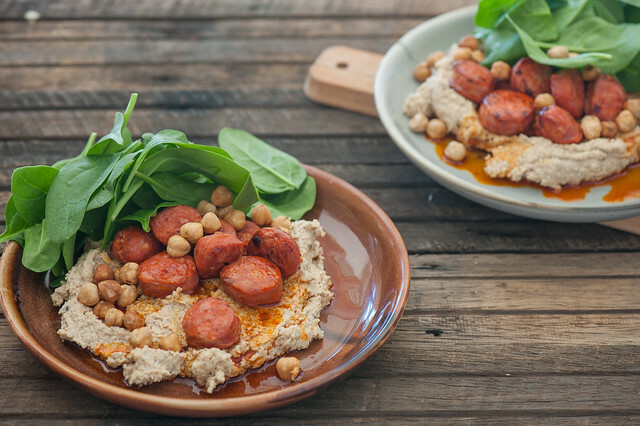 This is not meant to be a complaint…BUT.. the recipe above is called “Hummus w Chorizo & Almonds”…however…the list of ingredients calls for the use of hazelnuts, not almonds.